These units are available with two different control designs to meet your requirement. ; They are available with digital electronic ignition, or as a millivolt design. The digital system (pictured) requires external power (120VAC or 240VAC) and generates a pilot only when there is a call for heat. ; It provides simple setup and easy programming, as well as easy-to-understand diagnostics and simple connections to remote controls. The millivolt ignition system does not require external power. ; It generates its' own current internally, with a small thermocouple driven by the constant pilot. The millivolt ignition system is not available in California for natural gas units. See Digital vs Millivolt for more details. The Raypak gas heater comes with an automatic bypass built into the header. 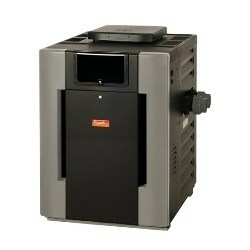 ; You'll find that the heater is capable of handling water flow at a rate up to 125 GPM. Energy-smart Raypak heaters consistently achieve the highest efficiency ratings. ; They exceed all federal and state standards.